Considered to be the most influential name in magic today, Criss Angel built his career by having a visionary approach and groundbreaking material. 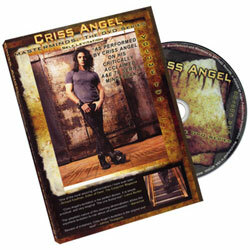 Now for the first time ever, it’s available to you, in his exclusive Criss Angel Mastermind DVD series (volume two). The explanation of his most talked about demonstration - Self Levitation - as created by Criss Angel (inspired by a Jacob Spinney concept) and performed by Criss Angel on his critically acclaimed A&E television series MINDFREAK. Criss teaches everything you need to know about this modern day miracle; step-by-step instructions on the method, how to construct it (gimmick materials needed can be purcha?=A??sed locally for approximately $125) and how to perform it. Levitate up to a chair, on an escalator, in the street, on stage, anywhere! This demonstration can be performed in close proximity to a single spectator or to an audience on stage. Levitations can cost thousands, now you can create Criss Angel's version for less than $300.